Still lifes can incorporate any number of things and may include animate or living creatures as well as inanimate objects. They can also be indoor or outdoor scenes or a combination of both. I think of still lifes as a way to honor the existence and value of the things that surround us or that we use every day as well as well as the things we reserve for special occasions. "Green-Seated Chair with Old Toe Shoes" Oil 48"x 30"
"Green Seated Chair with Old Toe Shoes" was the result of my walking past the chair and being struck by the artistic potential of the scene. I was very surprised years later to come across a painting by Van Gogh of his pipe lying on a chair. Artists are often inspired by the same kinds of things, but I'm sure many people will assume my painting was influenced by Van Gogh's. It wasn't. "My Broken Dream" Watercolor 17 1/4" x 12 1/4"
I compare completing "My Broken Dream" to performing brain surgery. While many artists have broadly explored the intricate patterns in lace, I took this to the ultimate degree by illustrating the twists and turns in the littlest threads that make up this Battenburg lace. It required an intense amount of concentration and attention to detail. "The Red Buddha" Oil 12"x 16"
"The Red Buddha" is one of the darkest pictures I've ever done. This was an exploration of the color red as well as an exploration of dim light and deep shadow. Painting the reds accurately required three types of red pigments, and no white. This picture won first prize exhibition that focused on form and shadow. "Still Life with Fan" Oil 12" x 16"
"Still Life with Fan" was complicated and required a great deal of attention to the structure of the fan and the sheen of the ribbons. White pearls are easy to paint once you understand their subtle colors. 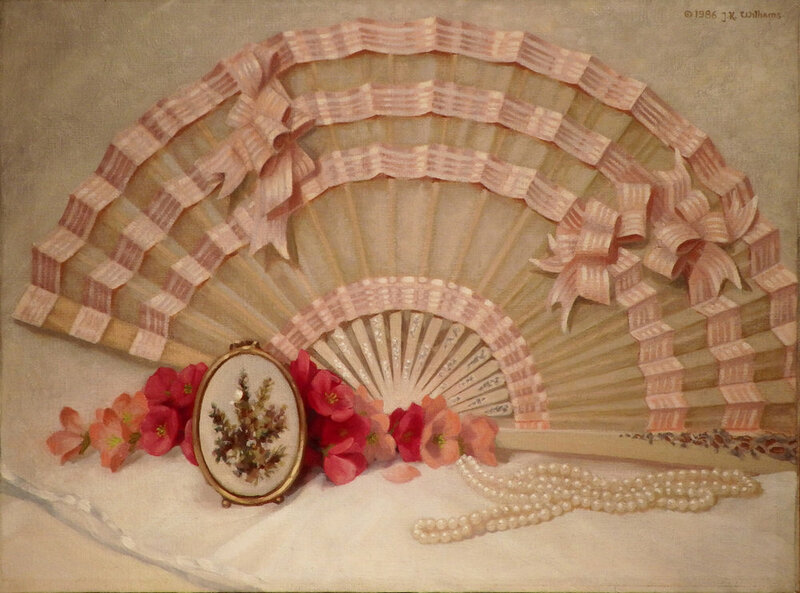 "Elegance" was an exploration of textures and surfaces, especially the texture of the gold lamé handbag and the silky texture of the pink ribbons of the fan. There's an element of mystery here, because two lit cigarettes rest on the little plate. Two people must be nearby. Are they getting ready to go out, or have they just come home? "Nudie Brunhilde" Oil 8"x 10"
"Nudie Brunhilde" is named for the ceramic sculpture gift that I subsequently put inside a bell jar to protect it. I particularly enjoyed painting the gold-casement on the alarm clock and the gloss of the satin glove. "In the Garden, Kirkibost" Oil 5"x 7"
"In the Garden, Kirkibost" is also included in the Animals section of this website. You can learn more about this picture there. It also appears in British Isles. "Haybales" is a scene in a Westchester, New York stable. Water from a wash-down of the stalls still stands on top of the flooring. These classic rectangular-shaped bales of hay are still the norm in stables, while huge rolls of hay are typically the type of hay bales you will see lying in farmer's fields today. "Geranium Barrel" Watercolor 6 1/8" x 4 7/8"
"Geranium Barrel" is also a kind of landscape, perhaps, as it is set outdoors at a horse stable. Note the antique wagon that helps to make this perhaps more of a still life than a landscape, though I have also included it on this site in the U.S. landscape section. "Sidewalk Blooms" Watercolor 4 1/8" x 6 1/8"
"Sidewalk Blooms" is a quick watercolor sketch I did along a path in Brooklyn Botanic Gardens. All rights to text and images are reserved by the artist.